I first discovered www.craigslist.org during my job search after college. Around this time, Craigslist was only available in 14 U.S. cities. The site was still in its infancy, but I knew that it would expand exponentially with a blink of an eye. 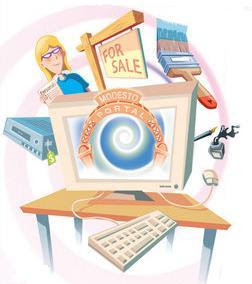 The network of online communities was the perfect venue for FREE online classified ads. It didn't take much to make me an instant Craigslist ambassador! I continued to share the Web site to my friends, family, colleagues, and even perfect strangers that I thought could benefit from learning about such a wonderful online community. The simplicity and ease of navigation appealed to me. I conducted job searches on Monster, CareerBuilder, local newspapers and readers (something I would NEVER even think of doing today), visited career centers, and blindly applied on company Web sites. What was I thinking? Believe it or not, I found my FIRST job out of college from Craigslist, a central network of online communities! Welcome to Web 2.0! Ever since then, I've used Craigslist to hire transcribers and freelance writers, sell and buy furniture, and find roommates and apartments. Unfortunately, my experiences have not always been positive. Introducing my youngest brother to Craigslist resulted in him being scammed out of $3,000. It was devastating to witness my brother lose his hard earned money to an online predator preying on naive kids that were simply too trustworthy. Here's the skinny: My brother wanted to sell his Playstation for $300 to save money for a trip. The buyer "mistakenly" sent him a money order in the amount of $3,300, and told him he could cash the money order at his bank (Union Bank). Once my brother received the $3,000 from his bank, he sent the remaining amount ($3,000) via Western Union. I know, I know, most of you are thinking...what an idiot!!! Hey, what can I say? People fall for these scams ALL THE TIME. Learn more about scams on Craigslist here. Scam artists are relentless and come up with new, innovative ways to take advantage of innocent consumers. Don't be their next victim! So if you decide to use Craigslist and you receive an email that mentions a money wiring service, don't even think twice - DELETE, DELETE, DELETE! Rule of thumb: If it's too good to be true, it probably is. I LOVE the Internet and can't imagine my life without it! However, we have to remember that the Internet also leaves the door wide open for con artists and bad guys to commit fraud. Check out this site for more information on how people have been scammed on the Internet.